Shop Tables and Industrial Workbenches fit in at Vocational Technical Schools, garages, and even your kitchen! US Markerboard has a large variety of Shop Tables, including Side Clamp Benches, Sheet Metal Benches, Locking Workbenches, Gluing and Staining Tables, and a Ceramic Work Table. Seat yourself comfortably at any of these Workbenches with an Industrial Stool! This Workbench Furniture is sure to fit in well at any work shop. So, if you need a Metal Shop Table or a Classic Wooden Table, there is something here for you! 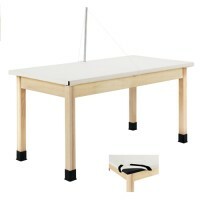 ADA Compliant Work Tables are just one of many ADA Items offered here at US Markerboard. If these Locker Workbenches and Storage Workbenches aren�t enough storage for your collection of tools, try out our Vocational Arts Storage. Pick the Adjustable Height Workbench or Kitchen Island Mobile Workbench that fits your style and you can get creating or working right away!